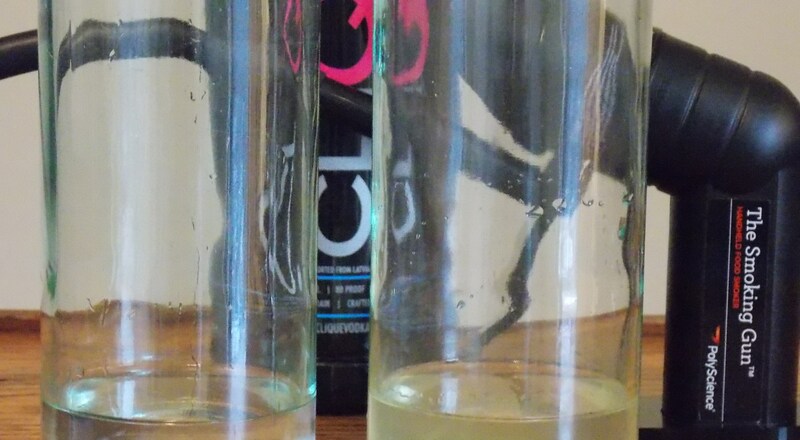 Add Clique Vodka to a clean sealable glass bottle. If you are smoking 1-2 oz use a 750ml bottle, but for more than that (or a more intense smokey flavor), use a larger bottle like a growler with a screw cap, or a 1.5 L with a cork or screw top (Stelvin closure). Load the chamber of the smoking gun with wood chips, about 1/3 of the way full- you only need a little bit of smoke to fill a 750ml bottle. Fill halfway for a larger bottle. Insert the smoking gun tube into the bottle and turn it on. Slowly ignite the wood chips and keep them lit until the entire bottle fills with dense smoke, then remove the flame, turn off the gun, remove the tube and seal the bottle. Shake the sealed bottle for a minute or two- until all the smoke disappears. Pour our a small sip and test it to see if it’s smokey enough. If you desire more smoke, just repeat the process. You can see the color change in the vodka after being smoked- different types of wood will also have different flavors. Apple and cherry wood chips are usually lighter, with pecan, alder and maple having a slightly more distinct smokey flavor. Mesquite are by far the most intense- most people describe the aroma as boldly reminiscent of a campfire. 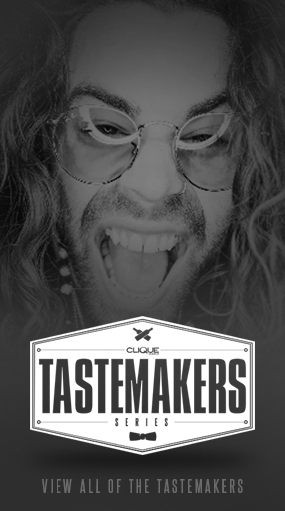 Now that you feel comfortable smoking Clique Vodka, make sure you check out these amazing smoked cocktail recipes from the #MixBook! 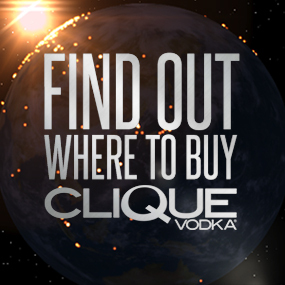 Click here to see how other people all over the country are sharing their Clique Vodka experiences with our live photostream! Tag a an Instagram pic of you and Clique Vodka to with #CliqueShots join in and be entered to win a custom printed shot glass!